FILE - A passenger airliner flies past steam and white smoke emitted from a coal-fired power plant in Beijing, Feb. 28, 2017. 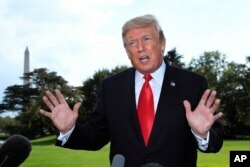 U.S. President Donald Trump says he hasn't read an ominous report by a U.N. panel that warned of a dire future for the planet if global warming is not kept to a minimum. But he said he will. "It was given to me and I want to look who drew it, you know — which groups drew it, because I can give you reports that are fabulous and I can give you reports that aren't so good," he said Tuesday at the White House. "But I will be reading it, absolutely." The comments were his first regarding the report released Monday by the U.N. Intergovernmental Panel on Climate Change. President Donald Trump speaks to reporters on the South Lawn of the White House in Washington, Oct. 9, 2018. The report lists how Earth's weather, health and ecosystems would be better off if world leaders could figure out how to limit future human-caused warming to 0.5 degree Celsius (0.9 degree Fahrenheit) between 2030 and 2052, instead of the globally agreed upon goal of 1 degree Celsius (1.8 degrees Fahrenheit). In June 2017, Trump pulled the U.S. out of the Paris climate agreement, which sought to reduce greenhouse gas emissions worldwide. His administration has also dismantled emissions reduction policies domestically. * It could be enough to save most of the world's coral reefs from dying. The panel met in South Korea recently to finalize the report. The world's governments asked for the report in 2015, when a global pact to tackle climate change was agreed upon. German biologist Hans-Otto Portner, one of the panel members, said some of the panelists were engaged in "wishful thinking" if they thought the gloomy report would encourage governments and people to act quickly and forcefully to counteract the report's predictions. Portner warned, however, "If action is not taken, it will take the planet into an unprecedented climate future."